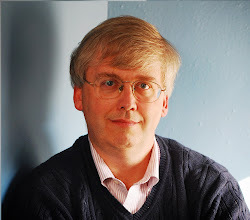 Each year, the White House Council of Economic Advisers published the Economic Report of the President, which can be thought of as a loyalist's view of the current economic situation. For example, if you are interested in a rock-ribbed defense of the Tax Cuts and Jobs Act passed in December 2017 or of the deregulatory policies of the Trump administration looks like, then Chapters 1 and 2 of the 2019 report are for you. Of course, some people will read these chapters with the intention of citing the evidence in support of the Trump administration, while others will be planning to use the chapters for intellectual target practice. The report will prove useful for both purposes. Here, I'll focus on some pieces of the 2019 Economic Report of the President that focus more on underlying economic patterns, rather than on policy advocacy. For example, some interesting patterns have emerged in what it means to be "out of the labor market." Economists have an ongoing problem when looking at unemployment. Some people don't have a job and are actively looking for one. They are counted as "unemployed." Some people don't have a job and aren't looking for one. They are not included in the officially "unemployed," but instead are "out of the labor force." In some cases, those who are not looking for a job are really not looking--like someone who has firmly entered retirement. But in other cases, some of those not looking for a job might still take one, if a job was on offer. This issue came up a lot in the years after the Great Recession. The official unemployment rate topped out in October 2009 at 10%. But as the unemployment rate gradually declined, the "labor force participation" rate also fell--which means that the share of Americans who were out of the labor force and not looking for a job was rising.You can see this pattern in the blue line below. There were some natural reasons for the labor force participation rate to start declining after about 2010. In particular, the leading edge of the "baby boom" generation, which started in 1945, turned 65 in 2010, so it had long been expected that labor force participation rates would start falling with their retirements. Notice that the fall in labor force participation rates levelled off late in 2013. Lower unemployment rates since that time cannot be due to declining labor force participation. 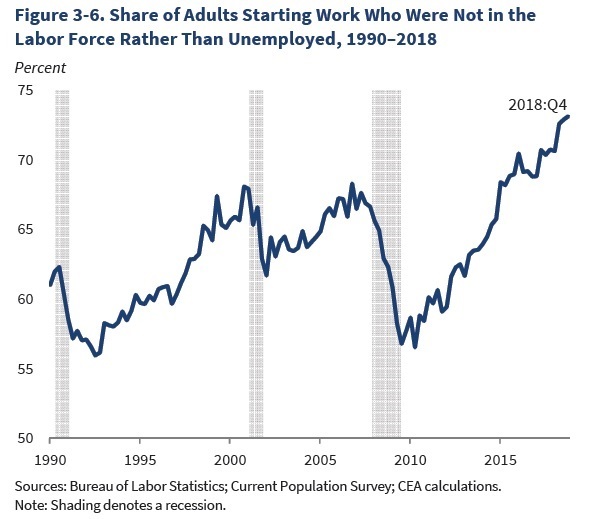 Or an alternative way to look at the labor market is to focus on employment-to-population--that is, just ignore the issue of whether those who lack jobs are looking for work (and thus "in the labor force") or not looking for work (and thus "out of the labor force"). 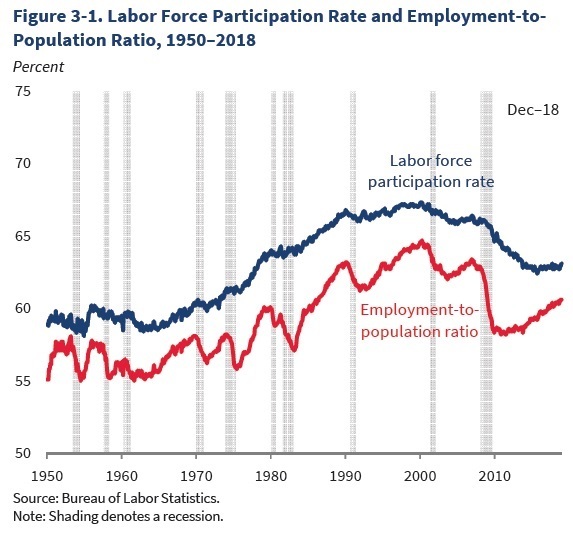 At about the same time in 2013 when the drop in the labor force participation rate leveled out, the red line shows that the employment-to-population ratio started rising. What especially interesting is that many of those taking jobs in the last few years were not being counted as among the "unemployed." Instead, they were in that category of "out of the labor force"--that is, without a job but not looking for work. However, as jobs became more available, they have proved willing to take jobs. Here's a graph showing the share of adults starting work who were previously "out of the labor force" rather than officially "unemployed." A couple of things are striking about this figure. 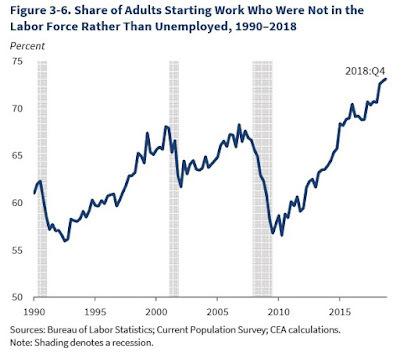 1) Going back more than 25 years, it's consistently true that more than half of those starting work were not counted as "unemployed," but instead were "out of the labor force." In other words, the number of officially "unemployed" is not a great measure of the number of people actually willing to work, if a suitable job is available. 2) The ratio is at its highest level since the start of this data in 1990. Presumably this is because when the official unemployment rate is so low (4% or less since March 2018), firms that want to hire are needing to go after those who the official labor market statistics treated as "not in the labor force."